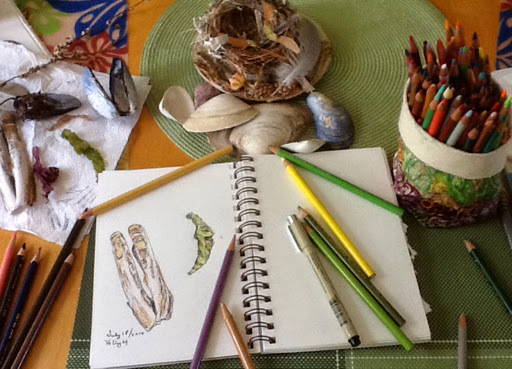 On my at home days, I seem to float along in a world of color, line and texture. It's seems to be a phase I'm going through this summer. 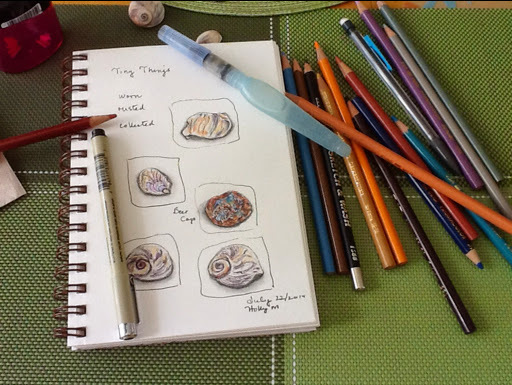 While I'm eating breakfast, I'm thinking maybe I'll do a crossword and skip the sketch, but then I start picking at my drawing things and before I know it, I've picked up the pencil. 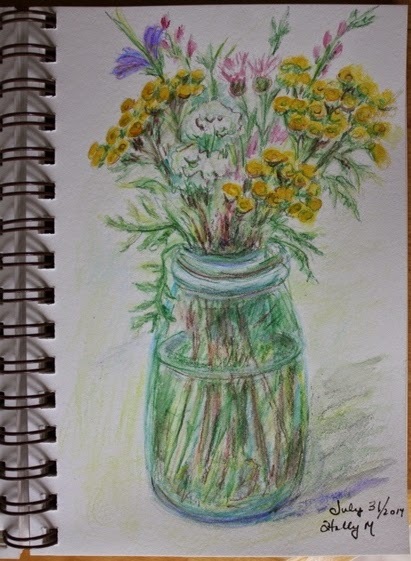 I did an interpretation of my flower jar (I say that because I edited it a bit to fit my small sketchbook) both at breakfast and lunch. I thought you might like to see my view while at the table. My lunch today; I'm always trying to be healthy! I can manage to sabotage it with my sweet tooth. Spinach and lettuce from my garden, veggies, an egg, sardines and a fresh banana bran muffin. Once the mist let up this morning, I took a little stroll around the garden. 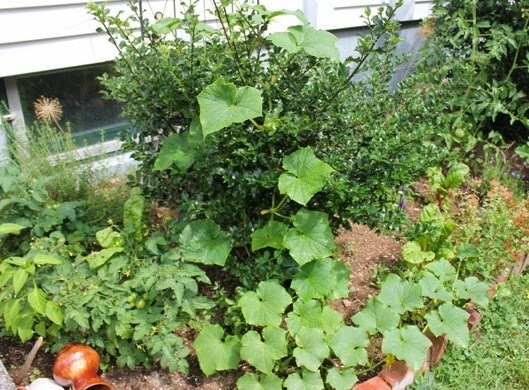 I planted cucumber in my usual flower garden since I lost my veggie garden space this year. It has decided to climb around the holly bush. 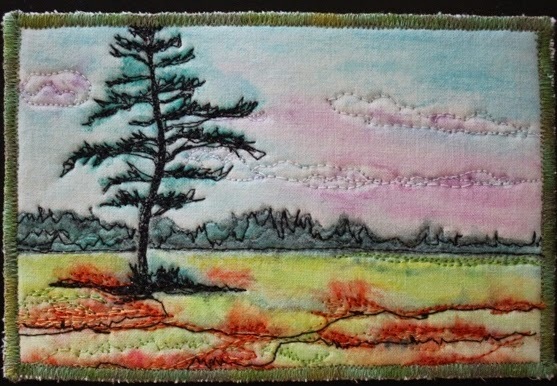 Finally, I've finished the fiber art postcard that I want to put in the mail to someone special. Although I've made many postcards, I've never actually tried to mail one before. We'll see how that goes tomorrow. Since it is going to be mailed (fingers crossed), I restrained myself in the end from adding too much detail. My husband is on his way home. He is starting his vacation. we will be making a couple of small trips and have some visitors --my son and his wife--so my I may be away from the blog for a bit. Today was one of my two days a week to have the car which means that I do a few errands in place of studio time. 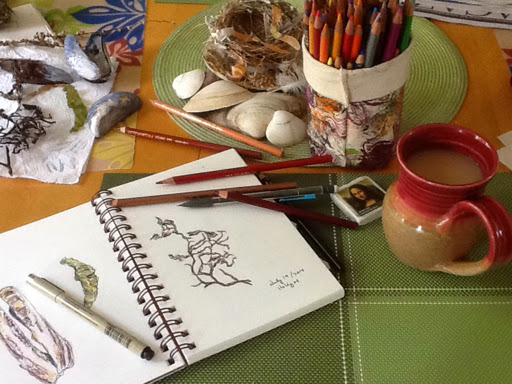 I did spend some time at breakfast doing a sketch of a few more of my gathered treasures. After that, I went for a very short walk using my walking poles and carrying a plastic bag and scissors for snipping some wildflowers. 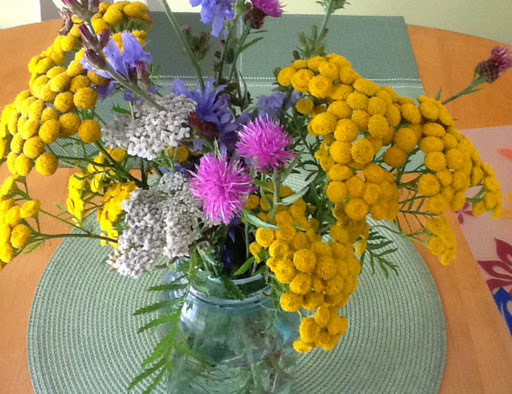 I found tansy, yarrow, asters and thistles. I think it's every bit as pretty as a bouquet of flowers. 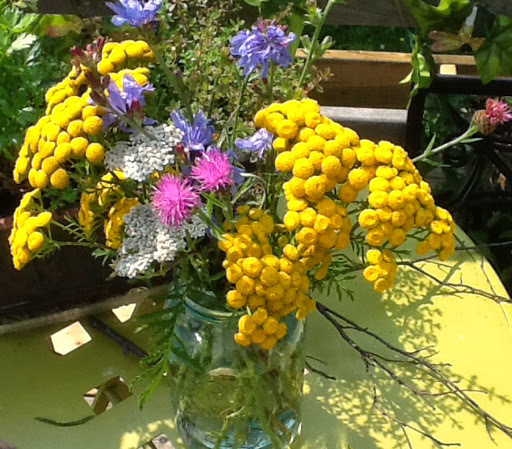 Every year when I notice the yellow tansy, I have to pick a bunch. It dries quite well and stays yellow for a long time. Unfortunately, my little walk caused me a lot of pain in my hip and I spent the rest of the day hobbling around. I had an X-ray for it just this afternoon. Could possibly be osteoarthritis in the hip. We'll see. Goodness I am having a very sluggish day. I started by sleeping in and I've been moving like a snail ever since. It took me most of what was left of my morning to get the vacuuming and chores done. My head's in a fog too. I'm going to blame it on the cloudy, muggy weather. 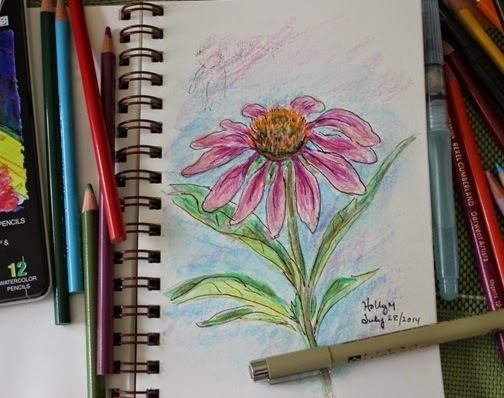 Needing something cheery on a grey day, I went out and plucked a cone-flower from my garden for my lunch time sketching session. 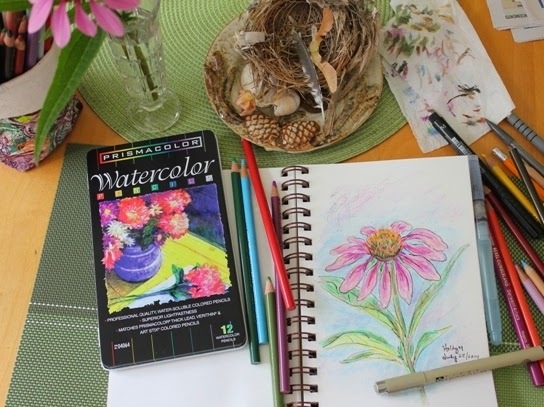 I used my latest favorite combo-- colored pencils and watercolor pencils. After that I was a bit restless, trying to decide what I felt like doing. I checked the weather and it seems we're in for more rain and possible thunder showers tonight, so I decided to go outside for a bit of exercise. I managed to ride my bicycle around the neighborhood in the easiest gear for about 15 minutes. With both a knee and hip problem this summer, I can manage only small bits of chores or exercise. I'm not sleeping well. either. I'm stubborn and tend to push too far. Once I'd trimmed one more shrub (I can do one at a time), I was satisfied that I had done the most I could do. 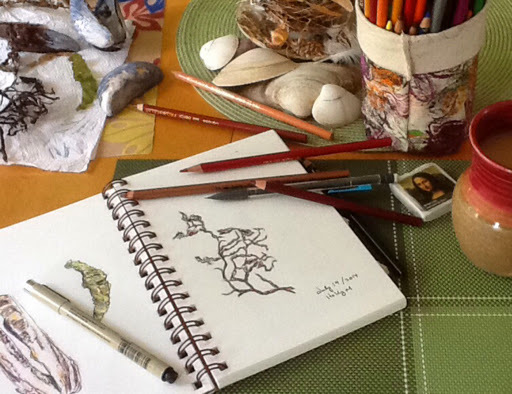 I came inside and settled in my studio to do a little stitching on the postcard. It's almost done. I have to stop myself form adding too much detail, as I'm planning to put it into the mail. On the weekend, I got the little second hand store desk put in place to see how it would work. My cutting mat fits perfectly and now I have empty drawers! I might put wheels on it which would raise it up a bit more and I can't decide if I want to paint it or not. Sorry for the lighting; it was back lit by the window. I must go see what I can do about supper. I haven't anything planned yet! 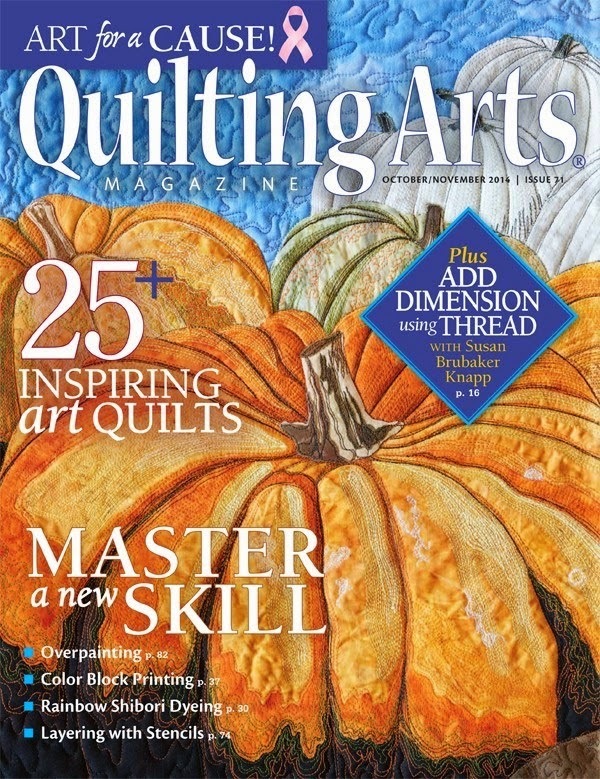 I've just found out that I won a giveaway at Linda's Art Quilts. 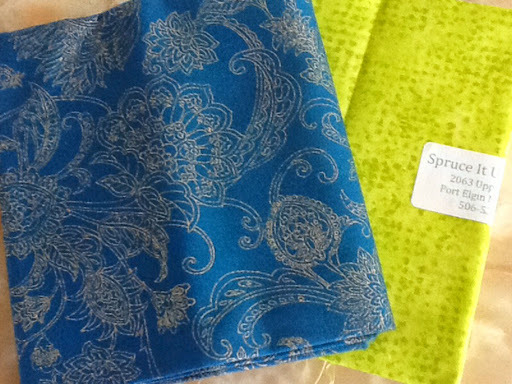 And the prize is some hand dyed fabric which is just what I need for my fiber art. 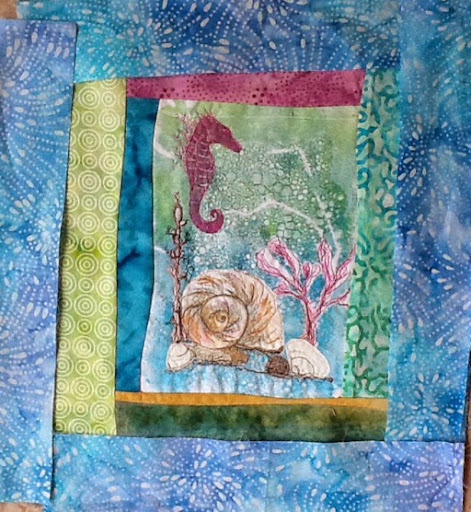 I found her blog through a blog hop promoting the new season of Quilting Arts TV. There'll be no sewing for me today; I'm getting ready to go a barbecue at the beach for my father in law's birthday. It's a warm sunny day so we likely would have headed out there anyway. It's always nice to get together with lots of family. 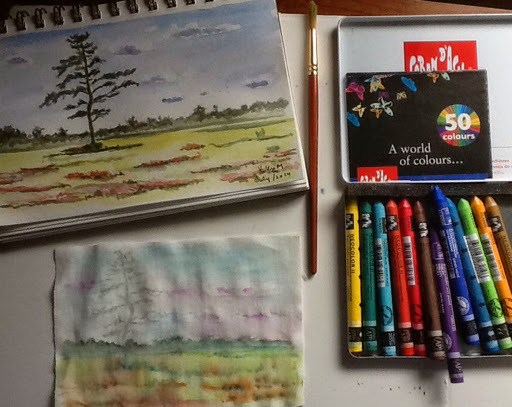 I did do a sketch with my tea after breakfast this morning using colored pencils and some water-colour pencils. Also, this is in the middle of my sewing room, upside down while it awaits felts for the legs. I picked it up at the second hand store yesterday. 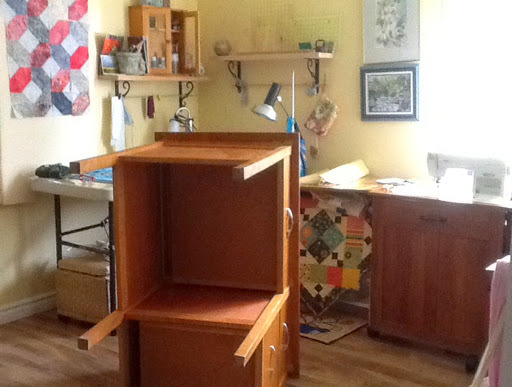 It is going to fit between my sewing cabinet and cutting table. I may paint it first. 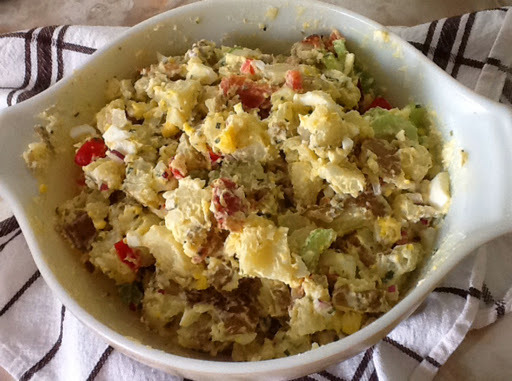 I spent half my morning getting a line of clothes out, frosting cupcakes, and making this rustic potato salad. It didn't start out to be a great day--I went to bed with hip pain last night and awoke with it at 4AM. I took pain medication but couldn't get back to sleep until it was time to get up to drive my husband to work. My day for the car. I am thankful that I no longer have to go work; I was able to come home after a doctor's appointment and have a bit of a rest. It is very hot and muggy here today. Thunder storms are forecast for later today. I haven't' ventured out except for my appointment and to water my plants. After the rain the other day, I took this photo of my lily which just came into bloom this week. 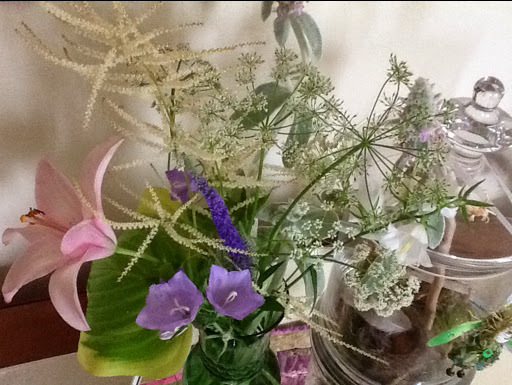 In summer, I always have a bouquet in the house although it's a little harder this year since I used some of my flower space for vegetables. 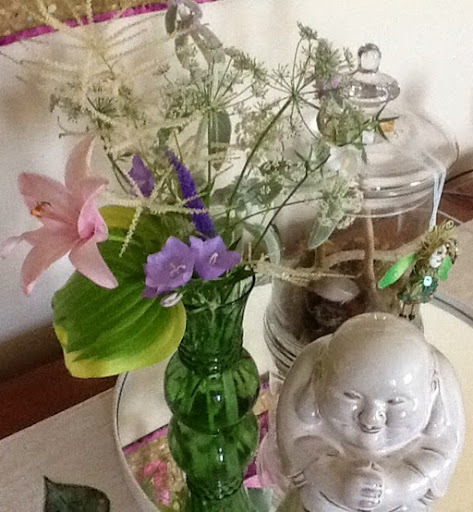 I'll add wildflowers to the mix occasionally as well as fern or hosta leaves. 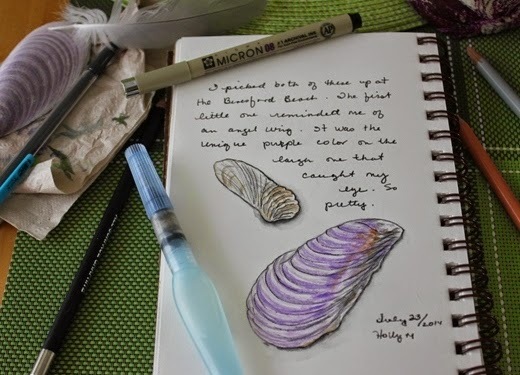 At lunch time, I still felt a little low, but the habit of sketching has become ingrained. It focuses me and takes my mind off the pain. I read somewhere just last night that the act of reating art can increase production of serotonin, so I guess it was just what I needed. 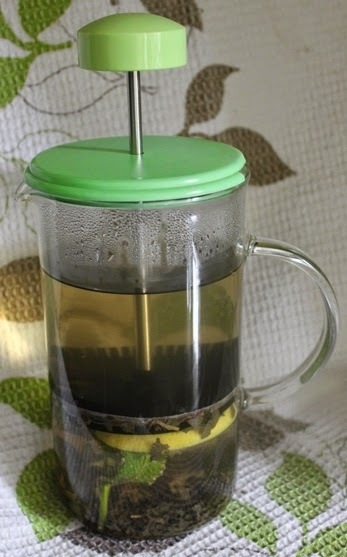 Something else that I saw recently on Facebook (Martha Stewart, I think) was the idea of using a coffee press to steep loose tea for iced tea. What a great idea! Add some honey and lemon and put it in the frig when cooled. While I was out this morning, I picked up a roasted chicken breast from the grocer and I made a corn and black bean salad to go with it. Easy. Gave me time to do a bit of stitching. This is postcard sized 4" by 6". 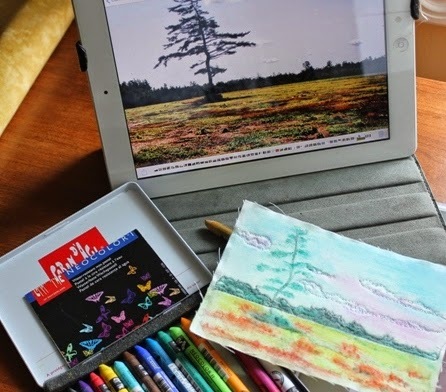 It is based on the picture you see on the I Pad screen taken by my niece.The background was done using the Neocolor II crayons and heat set. It's going to be a little gift for someone. A lady in the southern part of New Brunswick bought my ticket for the Kaffe Fassett talk that I was unable to make this past weekend in Amherst, NS. I thought it was great that I could sell the ticket; she thanked me by sending me two fat quarters in my favourite colors. How nice is that? I didn't know there was a quilt shop in a place called Port Elgin called Spruce It Up Quilting. I don't think it would be too far off the highway that one would travel to go to PEI. I haven't done much walking lately due to my knee and my hip so I haven't brought home many little bits from the trail. The Mosquitos have been pretty thick there anyway. Last night though, I made a little jaunt on my bike around the subdivision and I found a clump of dogbane which I just discovered last year. 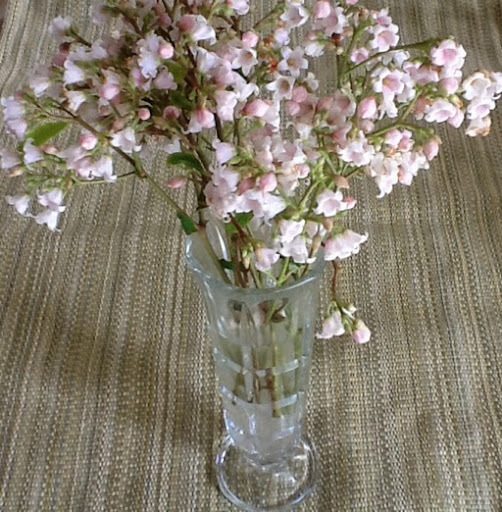 There was a lot of it so I couldn't resist bringing a tiny bunch home. 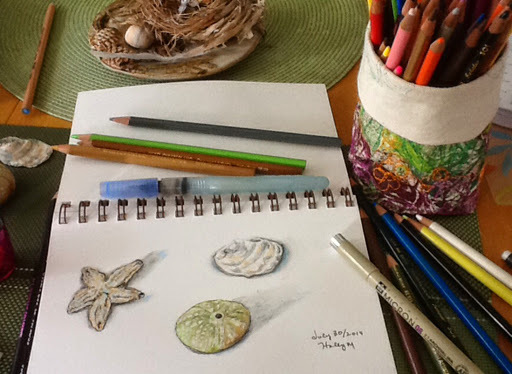 When it came time to finish up my lunch and pick up a pencil though, I went for a couple of tiny seashells and an old bottle cap. I almost could use a magnifying glass! Wow, I can't believe how fast the day has passed! 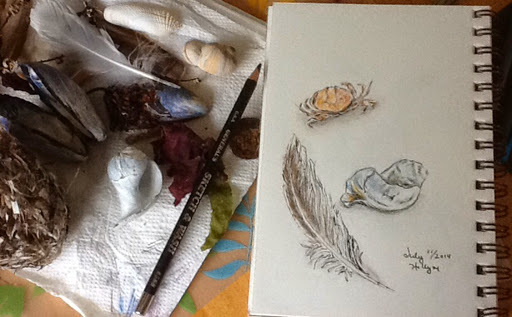 I got all my cleaning done this morning, even taking the time at breakfast and lunch for some sketching. My pile of inspiration is getting a bit unruly, but I'm managing to corral it on a piece of foam core board and a little plate in the centre of my table. Soon I may resort to a small box. I had planned to go to my sewing studio but stayed in the kitchen area as I was waiting for someone to come look at some work to be done. He was late (men!). 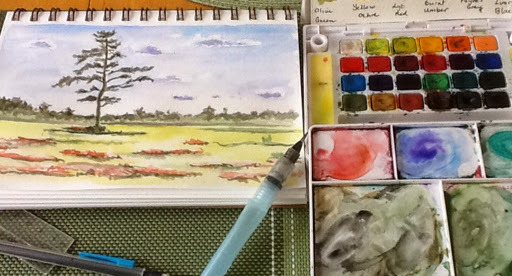 I kept busy doing a little watercolour of a picture that my niece took and posted on Facebook. 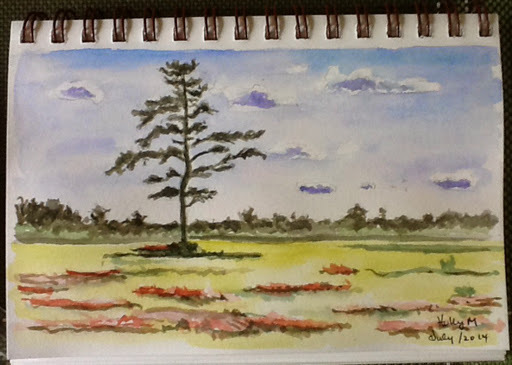 I've always loved big old pine trees! 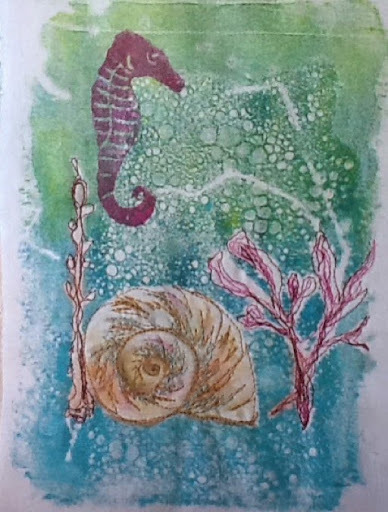 I used a waterbrush and Koi watercolours by Sakura. 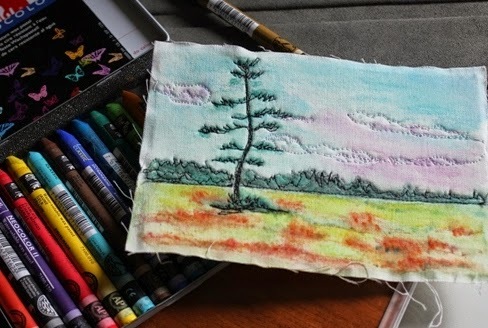 Then I took out a small piece of white cotton fabric and added a quick wash of colour using my Neocolor II crayons. 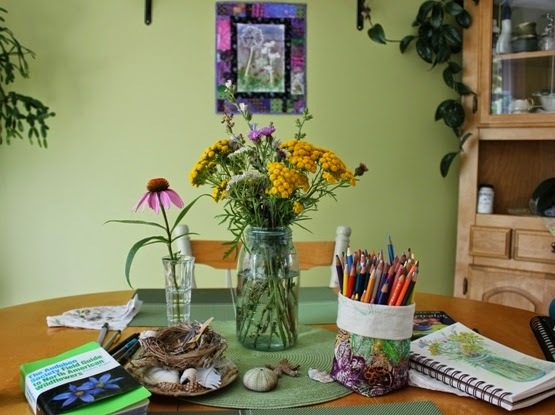 I recently purchased kits for postcards from Monika Kinner-Wlalen at My Sweet a Prairie and thought I'd try one. 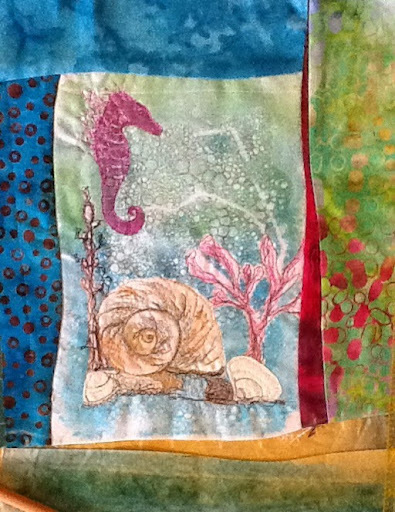 I'll let it dry, add the stabilizer from the kit and a bit of stitching, trying to keep it simple (hard for me to do). It' a postcard after all and I think I'm going to try to actually mail it. Soon it'll be time to get supper going. I've got to watch my line full of clothes. It's looking a bit dark. Wow, we are having a string of fantastic summer weather! I can enjoy it even more that we have the air conditioning to come home to; I run it at about 24C and not continuously so it's not shocking when you come in. Just cool enough for comfort. My husband went off to a golf tournament today so I packed for the beach. 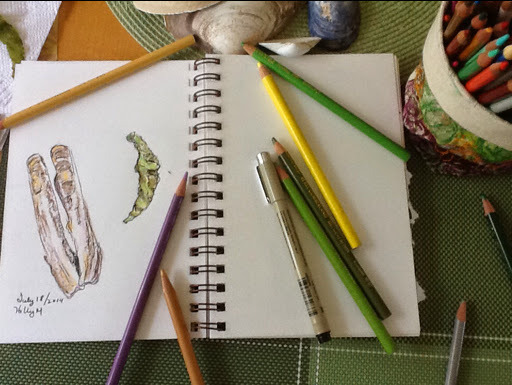 I did a tiny drawing of seaweed with breakfast. I stopped at the market for some fresh berries and fresh strawberry goat cheese on my way to my in laws. 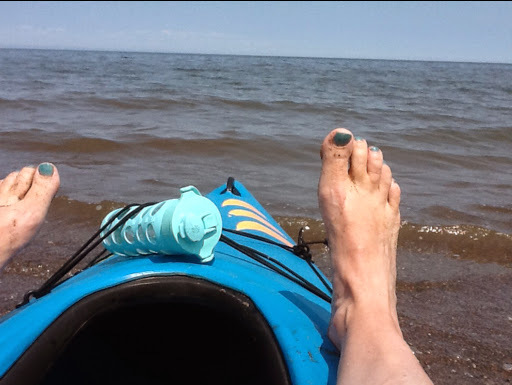 I've been nursing a knee injury for about 6 weeks and haven't been able to get into my kayak but I managed it today! I'm sitting a top it on shore here. You get the idea though, and sorry about that tippy horizon. Does it make you a bit seasick? 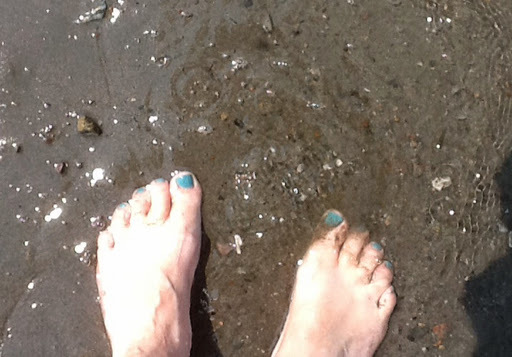 The water was beautiful true to its name, The Baie de Chaleurs. From my backyard I picked a few fresh flowers and now I've flopped on my sofa at home with a tea, my I Pad, and an ice pack. I've been out these past couple days, yesterday to the shop, and today, I'm going to physio and errands. Here is my Thursday breakfast sketch. 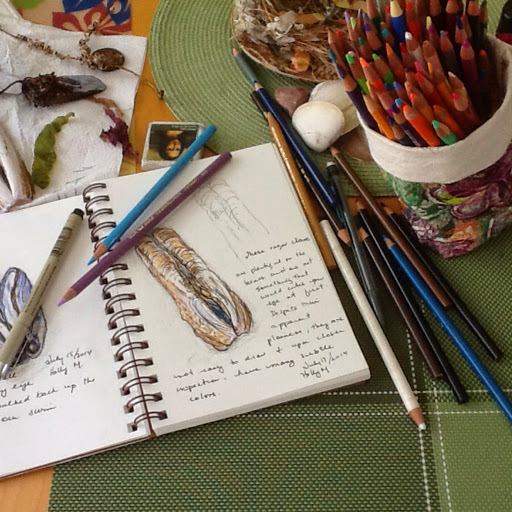 The razor clam is a challenge as are the ripples and curves in little bits of seaweed. Lots to keep my attention all summer! 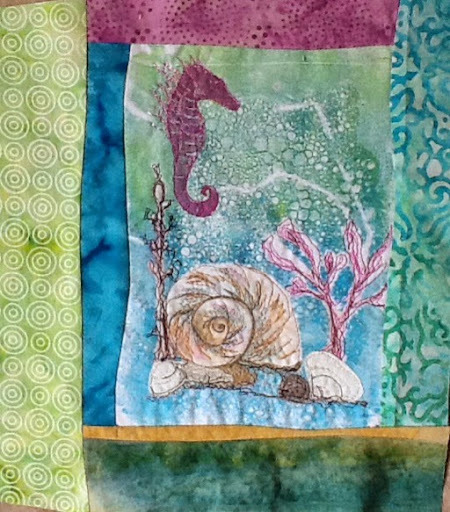 Over the course of the last week, I've been musing about the seahorse Gelli print piece to which I had thread painted and added some curved piecing. I mentioned in the post that I wasn't sure about the final borders, regretting that I hadn't added them using the curved piecing method. You can see it here with the first borders before the final ones. This morning while I was cleaning a few photos off the I Pad, I came across the piece before any borders and my first thought was, 'oh that's pretty'. Then I had to ask myself what had happened to cause my present unease with it. I believe I'm still being influenced by a comment from a judge on one of my past pieces. 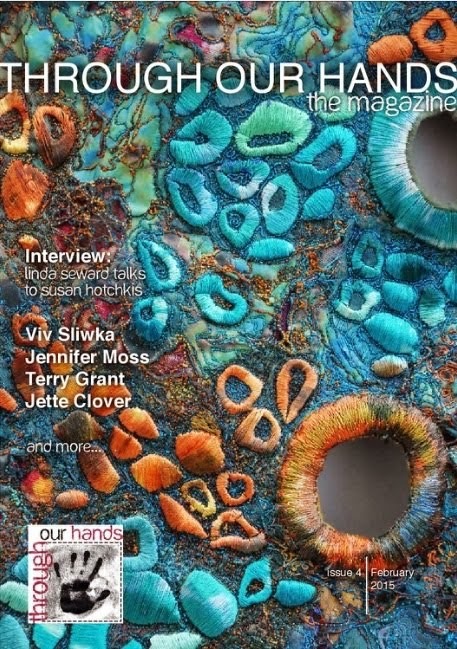 She may have been right, or not, but the quilt did go on to have acclaim and it remains one of my favourites. 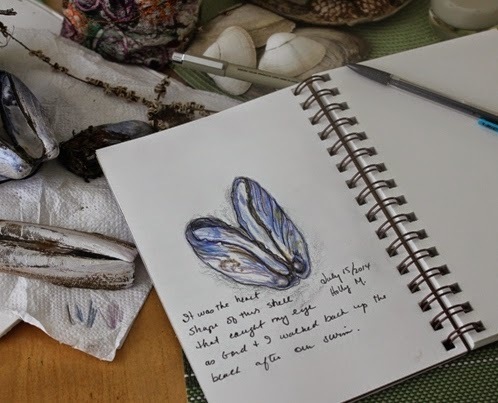 However, the comment still influences my work, sometimes constructively, it her times negatively. I think that's what happened here. That little voice was pushing my fingers to the darker fabrics while my own instincts were saying no. And thank you Sue for getting me thinking. 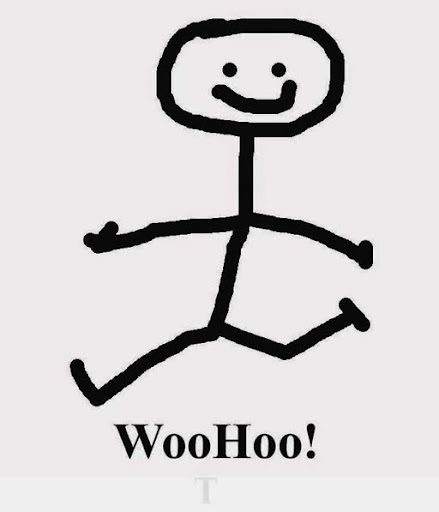 Now, I'm happier with it. The colors, though having less contrast, are 'sunnier' reminding me of sunlit waters. I have laid out the final borders here, but they will be added with curves. Maybe there will be a small mauve strip matching the one at the top that I will put in on the bottom right first. The blue will be thinner once the seams are added and the quilting and thread painting will tie it all together, as will the final hand embroidery. That's my hope anyway! Now that the worst of the black fly/mosquito season has passed, we are able to once again sit out on our deck in the evenings. I love to do this just before bath/jammy time. Last night was lovely, finally cooling a bit later in the evening. 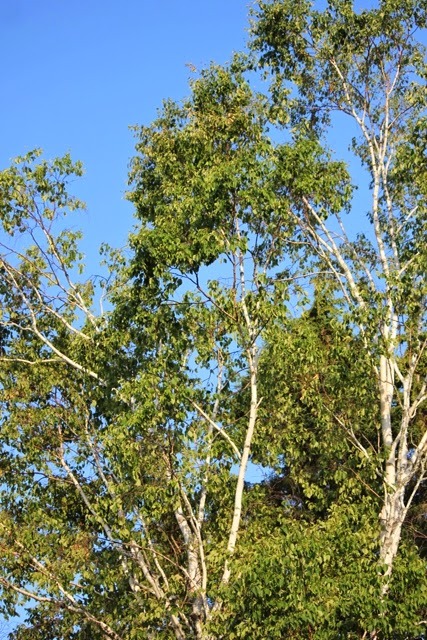 Sometimes I just sit, listening to the leaves rustling in the breeze and the birds twittering, sometimes being captivated by all the colors and movements and sounds. This is the view from my recliner. 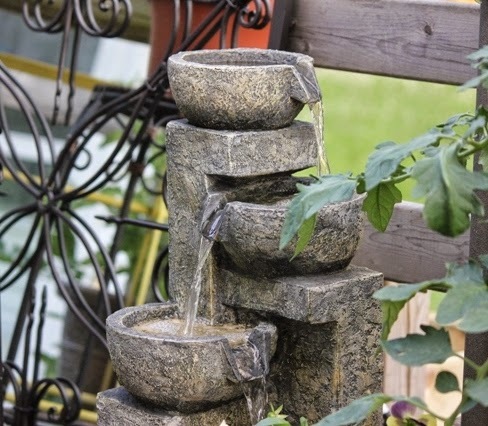 My little fountain provides another gentle melody. It's all enough to lull one into a quite state of bliss! Some nights I take my camera out and sit patiently with the long lens ready to capture any passing birds. 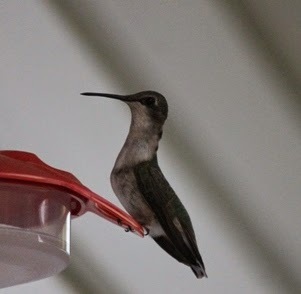 Last night, I was lucky to get the hummingbird although the light was fading. Their wing speed and strength amaze me. They were flying to this feeder on the day of Hurricane Arthur when no other birds were around. The way they squeak and chase each other around the yard is amusing. 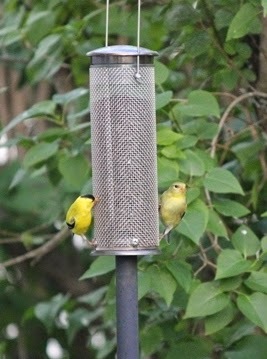 The goldfinches also have a funny squeak and chase each other. Who needs TV? 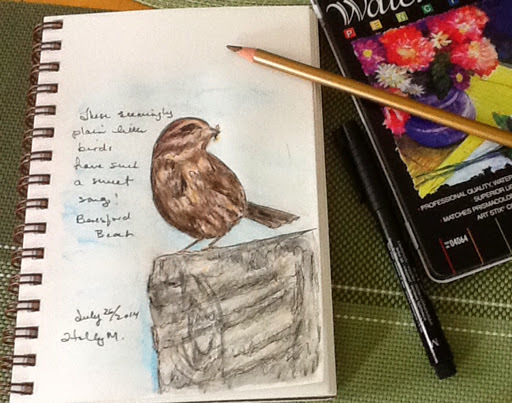 The night before, a chickadee came to the top bowl of the fountain and sipped leisurely. I was hoping for its return but no luck. I have even gotten pictures of them splashing in it. My clematis continues to open. I love this little vignette that can be viewed from my kitchen window. 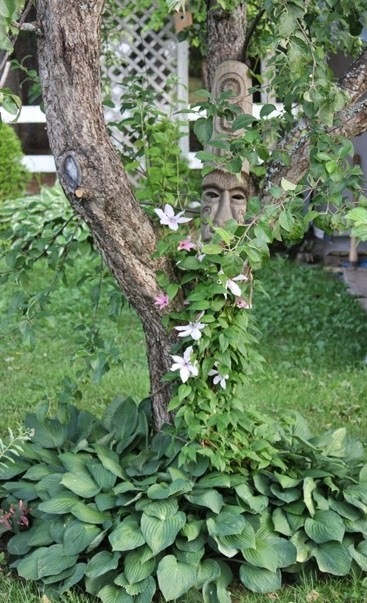 The more the clematis grows, the more the mask seems to be a part of the tree. 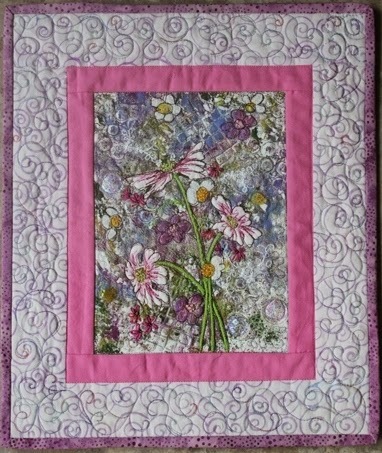 After a little outing this morning, I came into my sewing studio, cut the binding and sewed it on my cosmos piece. It is simply pressed back right now. I will save the hand sewing to be done during my stint at the shop on Thursday. 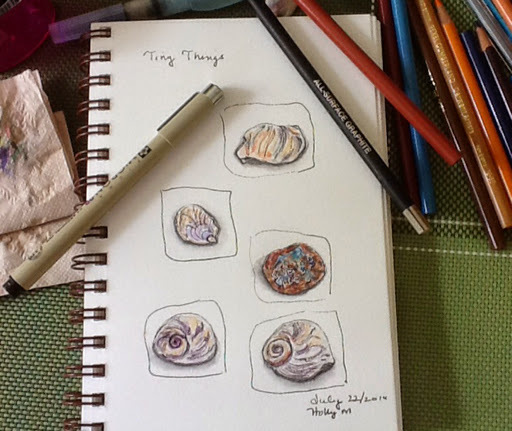 At lunch time, I finished up another small seashell study. It was challenging. I will be doing more of this one.